Horns & Hoofs Entertainment is an independent label established in 2002 by the people behind Boshke Beats Records. With more than 80 releases in digital and CD format, this cutting-edge label unites talented artists from around the globe, giving them a chance to introduce their perception of the innovative sounds of today and tomorrow to psychedelic music lovers everywhere. 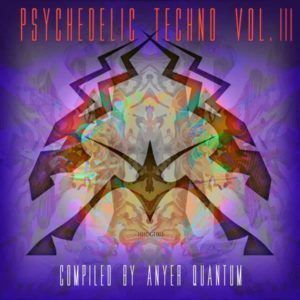 Compiled by Mexican DJ and producer Anyer Quantum, Psychedelic Techno Vol. 3 features selections from various digital singles released on Horns & Hoofs over the last few years. The intention is to give you a taste of the artists of Horns & Hoofs and their original vision of the psychedelic techno genre. Artwork by Inga Burina. Tracks 1/2/11 mastered by Volker Jakubzik (Alic); tracks 3/5/6/7/8 mastered by Konstantin Gervis (ZV_K/Triangle Eyes); tracks 04/12 mastered by Jacek Gawlowski; track 10 mastered by Colin Bennun; track 9 mastered by Manifold Studio (Cybered). MP3 Download | FLAC Download | WAV Download · Download count: 22,761. KUDOS!!! Thanks to all who is behind a such *Awesome work! * <3 From Azerbaijan. Good news, big tracks… , all track’s ! love how vacuum stalkers slips some micro sound into his track..! great job ..thank you ! I am a brand new fan of Techtrance. perfect album to onboard someone into this sub-genre. Namaste & Thanks from India!